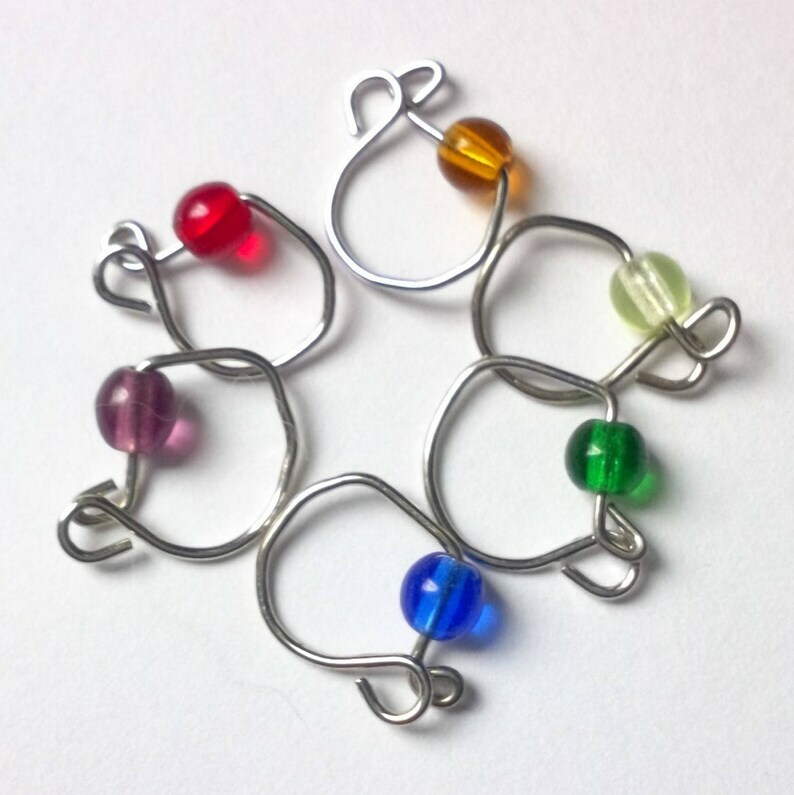 This set of 6 snagless stitch markers are made of gleaming glass in a rainbow of colors to coordinate with my abacus bracelets, but all on their own they'll sparkle and gleam with your movement as you stitch - truly jewelry for your stitches! They are designed to clip easily into your project as a beginning of round marker, lay close to your knitting needles on medium gauges, but they also work quite well on smaller needles. Stitch markers make a delightful gift for the crafter who loves you! These feather-light snagless markers slip smoothly from needle to needle. They are designed especially to easily move while your project is in progress, and work equally well in knitting or crochet projects. In the last picture examples of these markers are shown for reference on a US Size 8/5.0mm needle, which is the same size as an H crochet hook. Please note in the example photo there are 8 markers showing a fuller color range I offer in these markers, but this listing is for the 6 markers in the first picture. This item ships free within the US with any other accessory in my shop. Also see coordinating items in my shop. I offer gift wrapping and expedited shipping options. Check out my other listings for the gift wrapping add-on, and add an item to your cart to see the shipping options available to your location. Click "contact the seller" for more information or a custom listing. Because of the nature of hand-made items, there may be small variations between the item you buy and the one in the picture.